Review: Beautiful, strong, and majestic, these are all words that describe Petra the Lipizzaner stallion in Jane Kendall, and Ruth Sanderson’s Horse Diaries: Maestoso Petra. Petra is an old Lipizzaner stallion looking back on his youth. In the beginning of the story, just before WWII, Petra is born. He spends the first four years of his life on Piber, the farm. He is at his mother’s side racing his brothers and sisters, and living a fun life. One thing that he is anticipating is turning white. One interesting thing about Lipizzaner horses is that they are born black, and as time goes on they change to grey, and eventually to their final color of white. Then he talks about being chosen to go to the Spanish Riding School in Vienna, the most prestigious riding school of all. He is cared for by a man named Janni, who is very kind to Petra. When Petra is chosen to go to Vienna to go to the school, he doesn’t know what is going to happen. Janni actually pushes him into the cart, which surprises him a lot. Once Petra’s at the riding school, he learns to dance like a real Lipizzaner (LIPP-A-ZON). Petra, like most, can only master two air tricks, and takes lessons everyday to learn them. Once WWII breaks out, Petra, and the riding school is moved out of the dangerous city. After WWII the Lipizzaner stallions are going to have to prove themselves to the Americans to be saved, but Petra’s rider is hurt right before the show. His only other option is to send his sister, which would be totally ridiculous, but what else will he do? Find out in Horse Diaries! 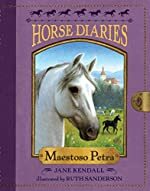 Overall I found Horse Diaries: Maestoso Petra to be a fantastic book. I loved the way the author acted like she was the horse, and really got into the horse’s head. Petra is easy to relate to, and being a horse lover myself, I think that he sounds like a good horse that would protect you. I also loved the way the author talks; it was sort of in a whimsical way, with great tone. For example, “I am old now, but I have been young. And I remember.” The opening is very unique, and creative; it starts out giving a basic summary of all that happens in Petra’s lifetime, but it doesn’t give too much away. I also loved how the story doesn’t only focus on one part of Petra’s life, but how it focuses on all of it. Ruth Sanders’ illustrations really add to the story, and helped me visualize all of the events. I like how the story seemed real, and gave me the world through a horse’s eyes. I would recommend this book for all horse lovers. It may be hard for little kids to understand, because it makes a lot of references to WWII, but I recommend this book for anyone over third grade, as it is appropriate for all ages. I give this book 5 out of 5 stars. We would like to thank Random House for providing a copy of Maestoso Petra for this review. Have you read Maestoso Petra? How would you rate it?